As always, the beef industry’s focus is on its own bottom line, with little to no regard for the suffering of the animals themselves. Every few years, a National Beef Quality Audit is conducted to examine the quality of the nation’s beef and compare it with previous years. The audit covers 75 per cent of Canadian cattle slaughter, and for the most recent audit included three visits to slaughterhouses in fall and winter 2016 and spring 2017. As in all previous years, the statistics reveal a variety of “quality defects” providing a glimpse into the handling, health and welfare of Canadian cattle. The percentage of animals with liver abscesses continued its historical climb and was significantly higher than in the last audit. Eighteen per cent of cattle livers had multiple large abscesses, up from 9.9 per cent in the 2010-11 audit. This increase is largely due to feeding grains to cattle, which is particularly common on feedlots. Grains are difficult for cattle to digest and lead to acidosis which causes intestinal gas to be produced in quantities too high to pass. The accumulating gas puts pressure on the animals’ diaphragms and lungs, making breathing difficult and painful. Some animals develop rapidly swelling sides and show their suffering by kicking at their sides or stomping their feet, and some of these animals die from the condition—a survey by Agriculture and Agri-Food Canada showed that one-third of “beef” cattle deaths were attributed to acidosis. At the same time, feeding grains to cattle increases populations of the bacteria Fusobacterium necrophorum leading to stomach wall abscesses, inflammation, and tissue death. These bacteria then travel to the liver via the bloodstream where they cause the painful abscesses. An estimated 79 per cent of cattle arriving at the slaughterhouse were covered with “tag” (mud, urine and feces), again higher than the 74 per cent found in the previous audit. Tag is only measured because it represents a cost to the slaughterhouse (extra labour is required to strip the animal’s skin off cleanly and any remaining feces must be cut off of the carcass). What tag represents is unsanitary, filthy living conditions common on feedlots. Although producers like to tell consumers that branding is a thing of the past, results from this survey show those assurances to be false. Thirteen per cent of cattle in this audit were branded, again up from the previous survey. Branding is intensely painful and causes third degree burns. 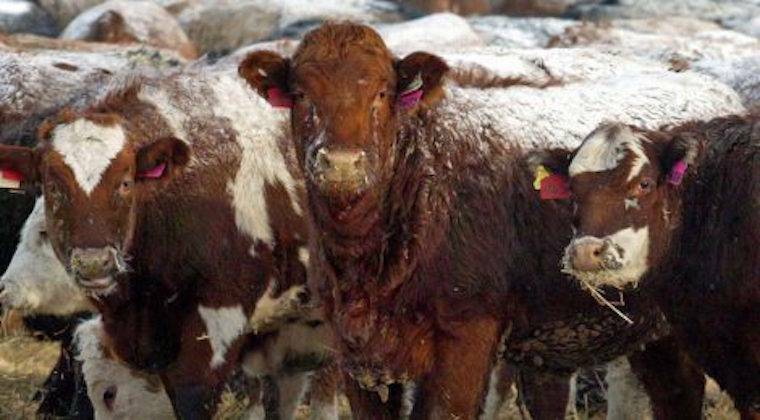 The percentage of cattle with bruises so large they had to be cut out was 30 per cent, but the specific number for cows alone (who almost always have more – and worse – bruising than fed cattle) was not provided. Bruising results from rough handling, slamming gates on animals and aggressive prodding, but steep loading and unloading ramps, overcrowding on trailers, and poor driving en route to the slaughterhouse also contribute to it. The National Beef Quality Audit takes great pains to outline the costs of these defects to the beef industry – seemingly the only reason why they are a concern at all, yet profit gains from current animal handling and rearing practices continue to outweigh the losses. As always, the industry’s focus is on its own bottom line, with little to no regard for the suffering of the animals themselves.